E-Waste Shredding – Do You Know How to Properly Deal with E-Waste? What exactly is E-waste and why is it important to know how to dispose of it? E-waste is a term used to describe any electronic products that either no longer work, are obsolete or are longer useful (unwanted). The EPA considers E-waste to be a subset of used electronics which have components or materials that can be reused, refurbished or recycled. The ultimate goal is to reduce the E-waste that may end up in a landfill either here in the U.S., or abroad – and a great way to achieve this is with proper e-waste shredding. Because of the speed at which today’s technology advances, within a few months or a year, most electronic devices become “trash”. Huge categories of old electronic items are making a significant impact on the level of the world’s E-waste. Everything from old TVs, VCRs, DVD players, and even Blu-Ray players, to laptops, printers, copiers and phones. These electronics have rapidly become obsolete, and are filling global landfills. 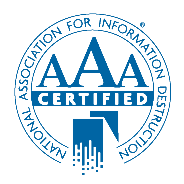 Most companies and consumers don’t realize that anything electronic can be recycled or destroyed, it’s just a matter of finding the right x-ray disposal or e-waste shredding services to handle the job. Today, the EPA estimated that U.S. consumers and businesses have discarded 2.37 million tons of televisions, computers, cell phones, printers, scanners, and faxes. Only 25 percent of these electronics were recycled and the rest went to landfills, where their precious metals were lost. The EPA has estimated that almost 60 million metric tons of E-waste ends up in landfills every year. Most electronics that are improperly thrown away contain some form of harmful materials such as beryllium, cadmium, mercury and lead. These toxic materials might only be trace elements, but when they are added up in volume, the threat to the environment is quite significant. Along with adding harmful elements straight into the environment, there is a lost opportunity to recycle if people continue to dispose of E-waste improperly. Almost all E-waste contains some form of recyclable material, including plastic, glass and metals. Destruction of these electronics must be executed with extremely special care. The destruction methods include, open-air burning and acid baths which can recover valuable materials from electronic components. These toxic materials, if not handled properly, can leach directly into the soil, water and air. Tackling the e-waste shredding problem will take time, but should always begin with educating others about the issue. Then, when there is complete knowledge of the problem, it will bring about changes in attitudes, behaviors and disposal methods. Remember, it was not long ago when most of were learning how to recycle paper, aluminum cans, and glass or plastic bottles. 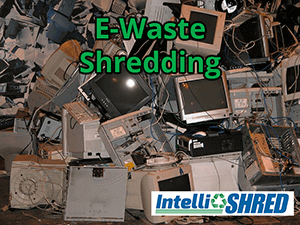 In order to achieve safe E-waste shredding and follow certified documented procedures, contact our team at IntelliShred. 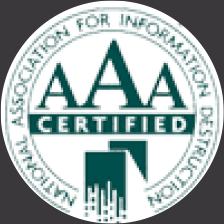 We have years of experience helping companies and consumers safely dispose of E-waste, as well as paper and other items. Contact us today for more information.